Elegant, understated and yet dashing – that describes this wonderful ikebana arrangement by Ambika Chandrasekar. The dashing red anthurium flowers in the centre charges up the scene, while the green props by way of the variegated reed grass on the lower level and the umbrella plants that reach upwards create a great colour balance. ‘Basically, my focus was to achieve an appealing, abstract colour effect’, says Ambika. Ambika sourced the thermocol prop for the base and the back from laptop packaging. The circular holed thermocol sheet placed at a slight angle adds a touch of modernity and provides a great backdrop for the vivid anthuriums. 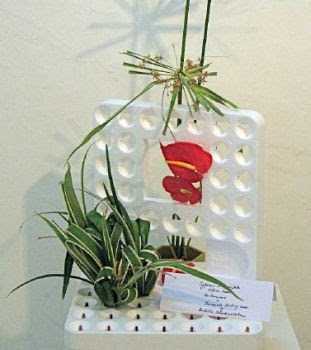 But wouldn’t a modern material like thermocol go against the ‘green’ spirit that ikebana celebrates? ’Not at all’, says Ambika. "The Sogetsu school of Ikebana encourages the use of new materials available". The umbrella plant is held in place by means of a pin holder (called kenzan in Japanese) placed in a vase. ‘I trimmed the leaves of the umbrella plant, so that the leaves don’t droop down’, Ambika adds. The arrangement will stay fresh for at least 10 days. A single anthurium stalk costs about Rs. 25 and can be obtained form florists, while reed grass and umbrella plants are common garden plants. There are many possibilities within this framework, with anthuriums now available in bigger sizes and an assortment of colours. Use your imagination. It is a beautiful art. An art form that gives you a closer connection with nature; an art form that looks great and radiates a live, feel-good aura; art that anybody can get into. Yes, of course; it is Ikebana, the wonderful Japanese art of flower arrangement that we are talking about. Ikebana literally means ‘alive plant material’ in Japanese. Not just floral decoration. Ikebana goes beyond and resonates with the spirit. Among the Ikebana schools, Sogetsu School has charmed the world the most. In 1927, Sofu Teshigahara recognised ikebana as a creative art and founded the Sogetsu School, which permits a high order of liberty in choice of material used. Beginning this week, we bring to you some wonderful flower arrangements, along with instructions on how to get it done, and a glance at the symbolism conveyed by the arrangement. Our good old Vaazhaipoo in ikebana? Yes, indeed, as this arrangement by Malathi Pandurang, Sankyu Shihan (diploma in Sogetsu School of Ikebana, Tokyo) shows, virtually any green material can go into the creation of an ikebana entity. "It is a theme with a colour focus, with whatever is available locally", Malathi explains. 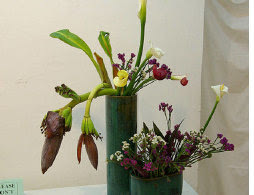 The tall vase is solid and sturdy, and it’s green colour and texture suits the plantain flower. To complement the plantain flower, Malathi has used purple and green statice flowers in the lower part of the arrangement. The tall vase is essential for using the plantain flower as the heavy plantain flower will otherwise droop right down to the floor, Malathi advises. The arrangement will stay fresh for a week, the banana material in particular. After every three days, you may cut the bottom edge of the stalks, to retain freshness. Change water after a week. Though spectacular, it is quite an inexpensive arrangement. The entire plant material cost Malathi just about Rs.20. It took Malathi a mere 15 minutes to execute the arrangement. "That is because I had already visualised the concept in my mind", she says. "Working with the mind, fingers and brain, and to see something beautiful emerge at the end of just half an hour, it is a rewarding activity. It gives me great tranquility", Malathi says.